Watch a recording of an online presentation with Rodney as he shows photos and talks about the fascinating story. Arrive in Sibiu, an important Romanian cultural centre located in the region of Transylvania, and meet your fellow travellers. Depending on your arrival time, optional afternoon activities could include a walking tour or visiting sites and attractions near your hotel. Receive a tour orientation over dinner. Begin discovering your Hutterite heritage in Romania at Casa Altemberger, which was Hermannstadt City Hall until 1948. Numerous Hutterites were jailed there. Then visit an orphanage built by Jesuits to house the Hutterite children they planned to abduct. At the Hermannstadt Penitentiary Workhouse, remember Mathias Hofer and three Carinthian teenage girls who were imprisoned there for 15 years. Your final stop of the day is the 200-year-old Brukenthal National Museum, the oldest museum in Romania, housed in the palace of its founder, the Transylvanian governor Samuel von Brukenthal. At the Museum of Folkloric Traditional Civilization, gain insight into Romanian culture as you explore this open-air museum’s wealth of exhibits on traditional village life. Visit two of Romania’s many fortified churches at Cisnadie and Cisnadioara, both built in Romanesque style in the 12th century. These strongholds protected villagers from Ottoman attacks until the 18th century. Depending on concert schedules, you may have the opportunity to listen to a noon-hour organ concert at the Evangelical Cathedral. This afternoon, explore Sibiu on your own, shop for souvenirs, or relax at your hotel. Travel to Romos, the first village in which the Carinthian Lutherans settled. In Romos, visit the Parochial house, now a museum, where the German settlers hid when the town was raided during invasions. Be amazed by Hunedoara Castle, one of the largest castles in Europe, built in a Gothic-Renaissance style. Then continue on to Deva for the night. 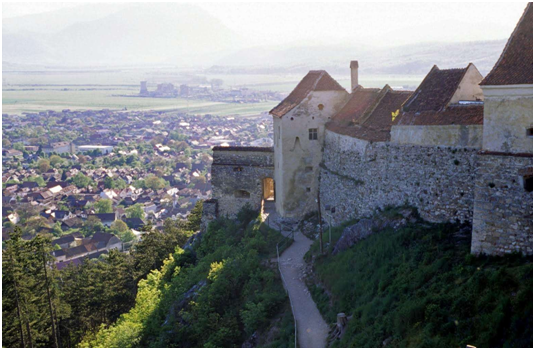 Tour the ruins of Deva Castle, where three Carinthian Lutherans were imprisoned in the dungeon. Later, shop for quality leather and fur items at an outlet store in Orăṣtie. Then continue to Vintu de Jos (Alwinz) to visit the ruins of a castle which was the site of positive and negative experiences for Hutterites. They were given sanctuary in the castle in 1622 but later the Jesuits used the castle as a prison for Hutterites. In Alba Iulia, one of the oldest settlements in Romania which dates back to the Roman Empire, take a self-guided tour of the wide, tree-lined streets of the citadel. Also, walk along the citadel walls. In Alba Iulia, enjoy a special opportunity to see Hutterite codices on an arranged visit at the Biblioteca Batthyaneum. View the spectacular Changing of the Guard ceremony at the Alba Iulia Citadel, then visit the New Gate of the city where Hutterite leaders were imprisoned in the citadel walls. See the 11th century Roman Catholic cathedral which once had a bishop who was a Hutterite landlord at Alwinz. Later, learn about Romanian Orthodox customs at an Orthodox cathedral. Admire the picturesque ruins of the Cârța Monastery, once inhabited by Benedictine monks. At Cincu (known in German as Gross Shenk), remember Carinthian refugees Johannes Hofer and Christian Nägeler, both of whom died in this village in about 1760. On your way to Bran Castle, drive through the Barza Valley as you follow the escape route of Hutterites travelling to Wallachia. Tour the famous Bran Castle, aka “Dracula’s Castle”, a stunning medieval stronghold that is now a museum. End the day in Brașov (Kronstadt)—a fortified medieval city which the Hutterites took great pains to avoid during their escape in 1767. Begin the day with some time to shop and explore the city of Brașov. Then visit the impressive Black Church, so-called because a great fire in 1689 blackened the exterior of this massive Gothic-style structure. Drive to Sinaia and tour Peles Castle, often considered one of the loveliest castles in Europe, as well as the nearby Pelisor Castle—smaller than Peles but beautiful nonetheless. Take a winery tour at Azuga, known for providing the royal family with their favourite wines. Begin the morning visiting one of the best-preserved peasant fortresses of Transylvania—the Prejmer fortified church, a UNESCO designated site. While driving through the Brasov Forest, remember the Hutterites who endured a difficult night crossing of this forest in 1767 to avoid being seen only to exit the forest in broad daylight. Then make your way to the Rupea Castle ruins. The Glanzer family and Gretal Wipf were taken to this fortress after being captured during the Great Escape. Hear more of their story at the nearby fortified church in Dacia (Stein) where they were initially captured and imprisoned. Visit the Viscri fortified church, a UNESCO Heritage site that is unusual because it was not built by the Saxons, before ending the day in Sighișoara. This morning, stop at the walled church at Crit (Kreuz) where Jesuits had the Carinthian Lutheran converts imprisoned. Then visit the Evangelical Church of Saschiz, a UNESCO World Heritage site built in the late 1400s. Return to Sighișoara, known for its well-preserved medieval Old Town. This afternoon you can relax, explore the city on your own, or join your tour leader Rod for sightseeing. Explore the city’s citadel, including the opportunity to climb the citadel tower for a spectacular view. Also visit the Medieval Torture Museum located at the base of the tower. As you travel back towards Sibiu, visit two fortified churches—in Mălâncrav, see a 14th century church featuring rare well-preserved Gothic frescoes depicting scenes from the Bible, then in Biertan admire a UNESCO World Heritage designated church which is one of the largest and strongest of Transylvania’s fortified churches. The Romani (often referred to as gypsies) are the largest minority ethnic group in Romania. Visit Romani village craftspeople, either coopers (barrel-makers) or copper-smiths. Time permitting, see the fortified city of Mediaș. Over a final dinner, reflect together on your experiences. Say goodbye to old and new friends as you depart for North America with new insights into Hutterite history and Romanian culture. Check the pricing page for what is included and excluded in the Hutterite Heritage tour fare.